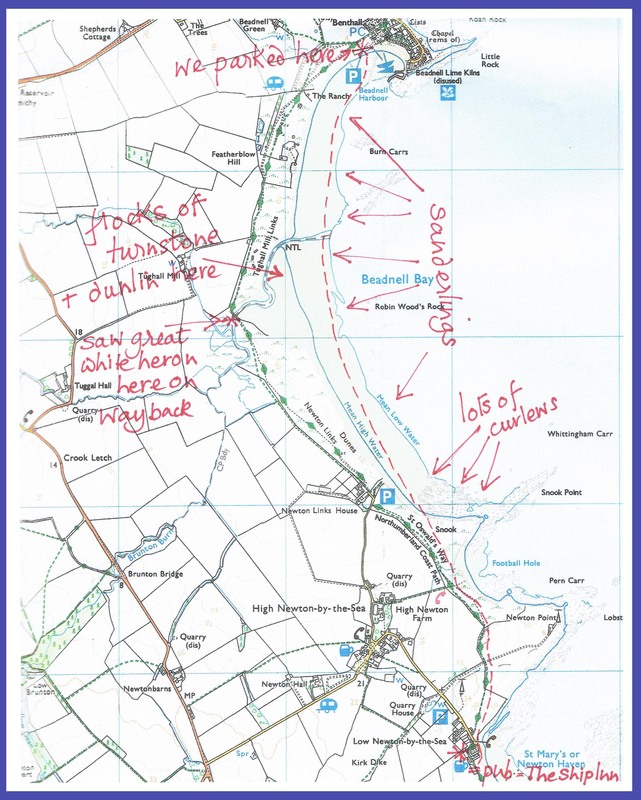 Yesterday we walked from Beadnell to Low Newton (some 3 miles as the crow flies). This is a beautiful walk any time of the year. Yesterday the conditions were just perfect – no wind, temperature about 5 degrees, tide probably at its lowest. 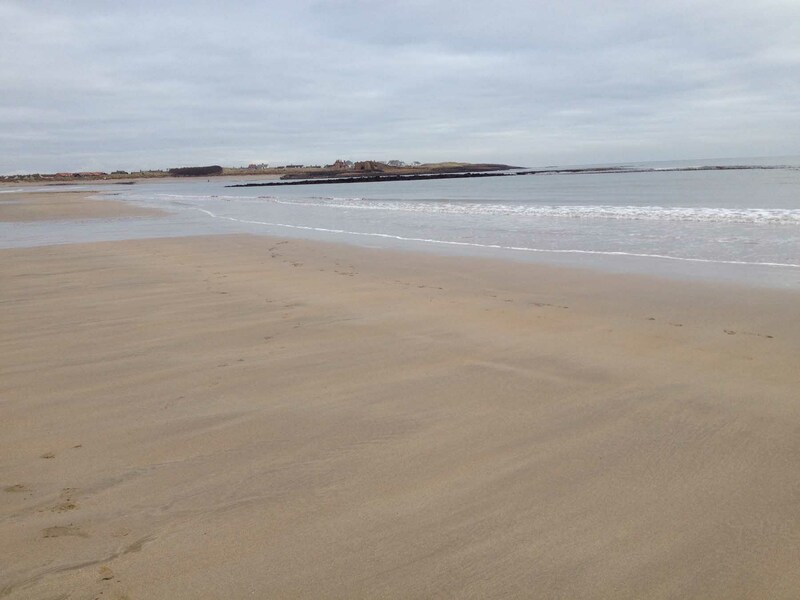 So we had the huge expanse of Beadnell Bay to ourselves for our walk to the pub at Low Newton. 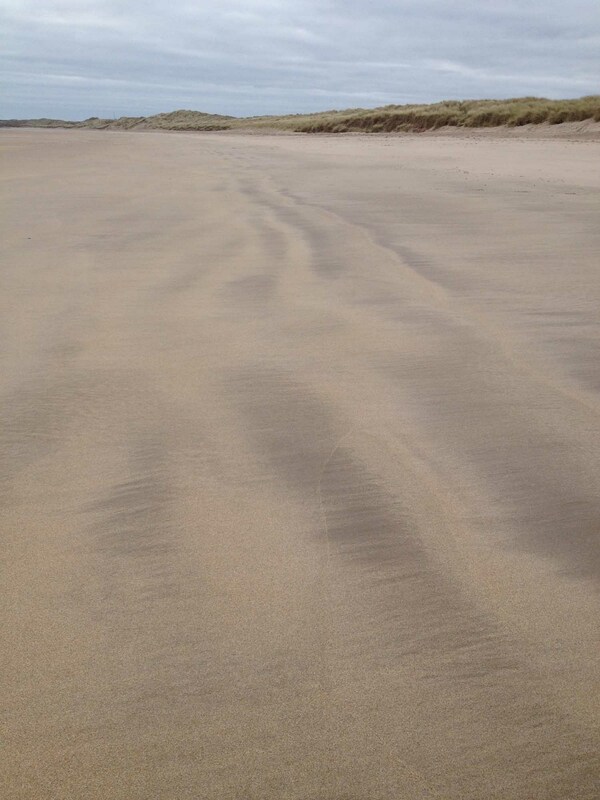 It’s one of the beaches that Northumberland justifiably is so proud of. 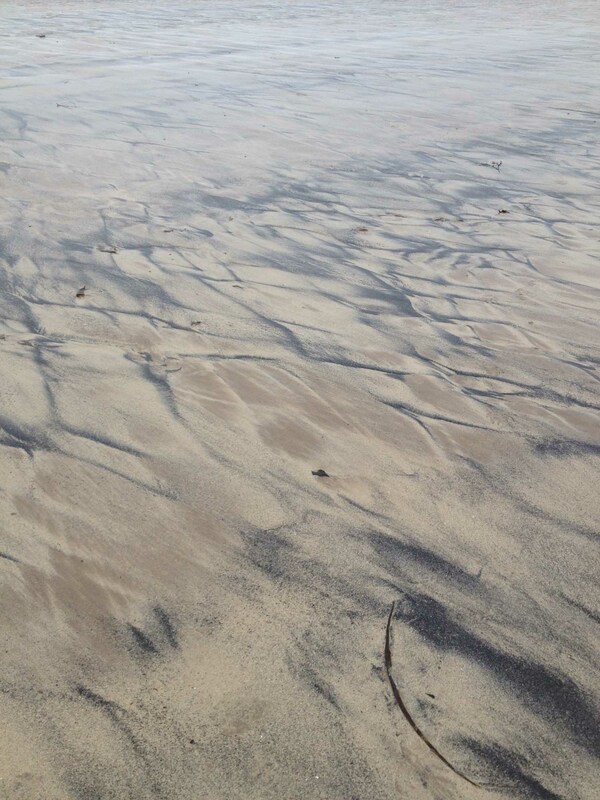 Huge expanses of sand and sea and sky. 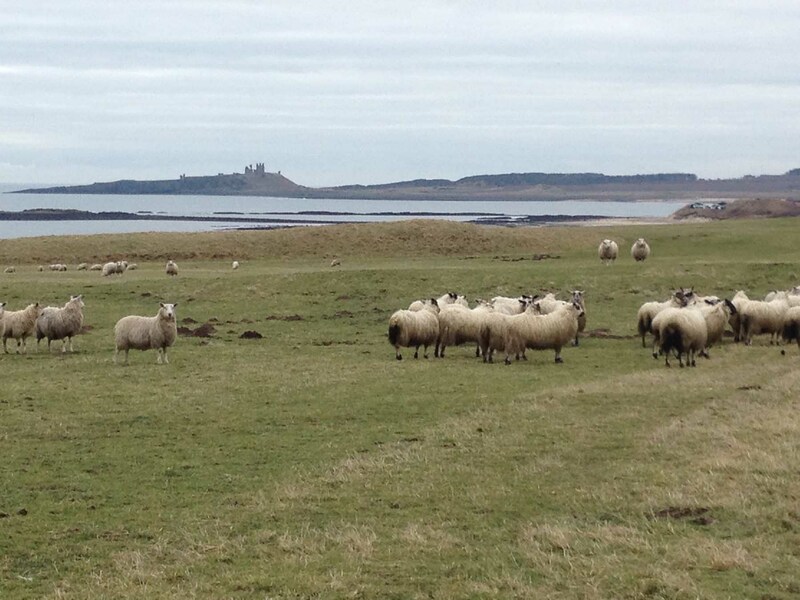 Best foot forward and looking south to our destination with a glimpse of Dunstanburgh Castle beyond…….. 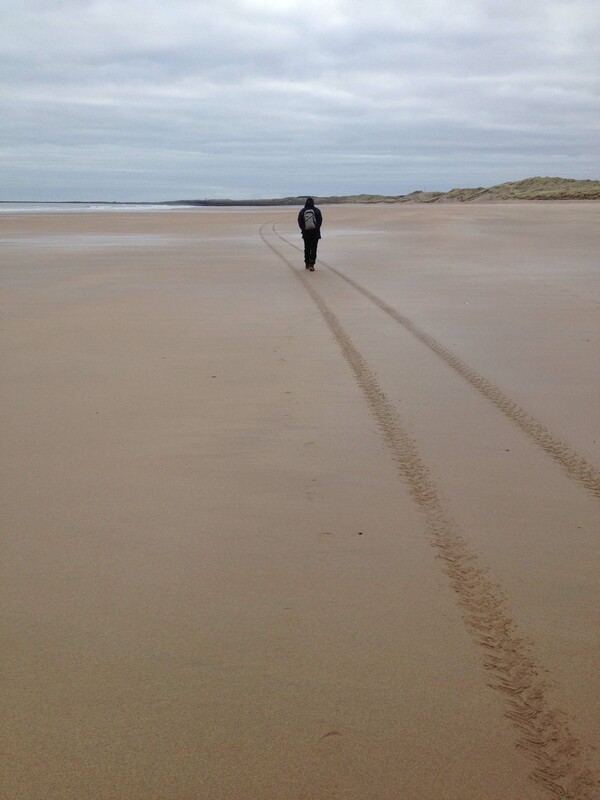 Looking back to Beadnell and its limekilns …….. Others had been there before us, but we felt it was ours …… Different sand patterns all along the beach. 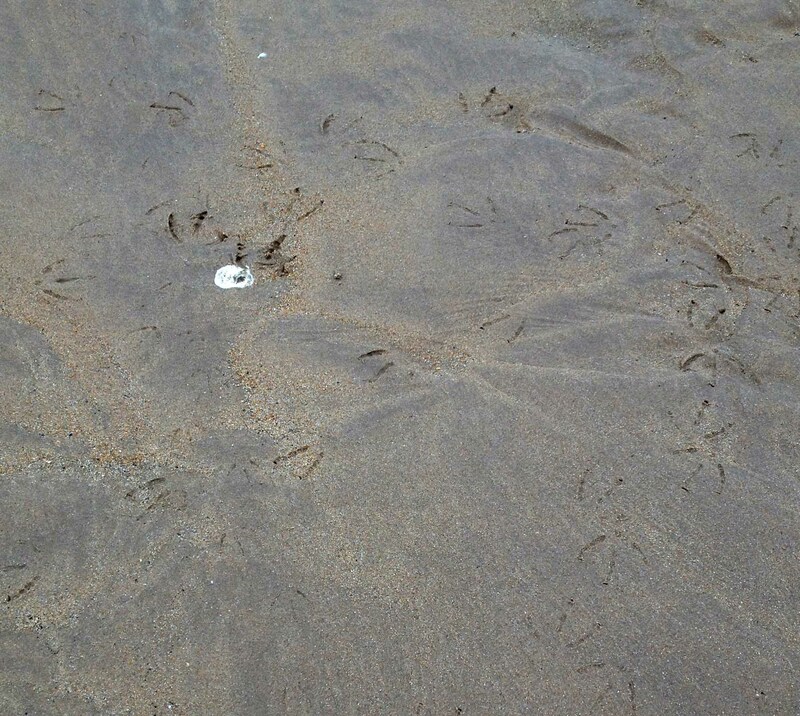 These are at the Beadnell end – is the black sand coal (coal fields run along the edge of Northumberland’s coastline) or broken mussel shells? 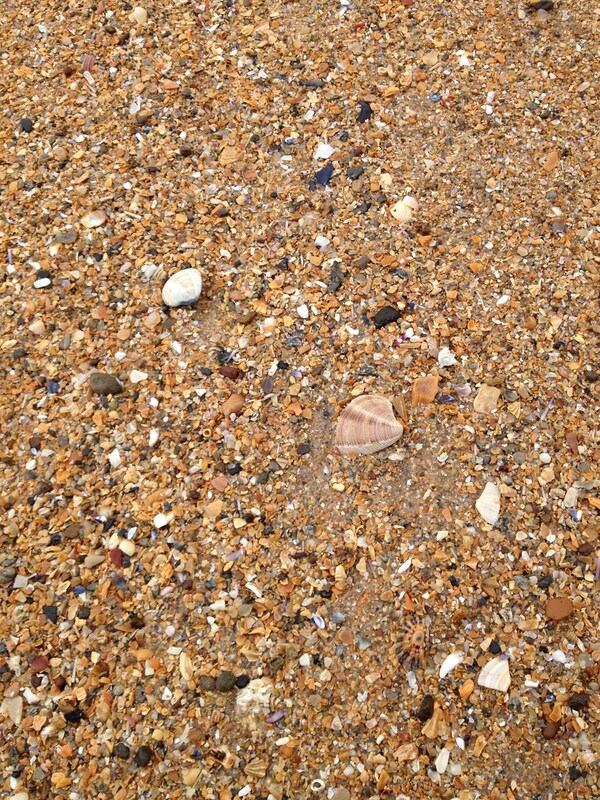 Further along small pebbles and shells make a pointy pattern – it’s as though the beach is wearing a crown ….. And a wavy pattern in the sands as you look along the beach to the dunes … In some spots there was evidence of a recent parliament of fowls… Not really a shelly beach (my favourites) but just enough Banded venus shells to keep me happy. Time for a coffee break. 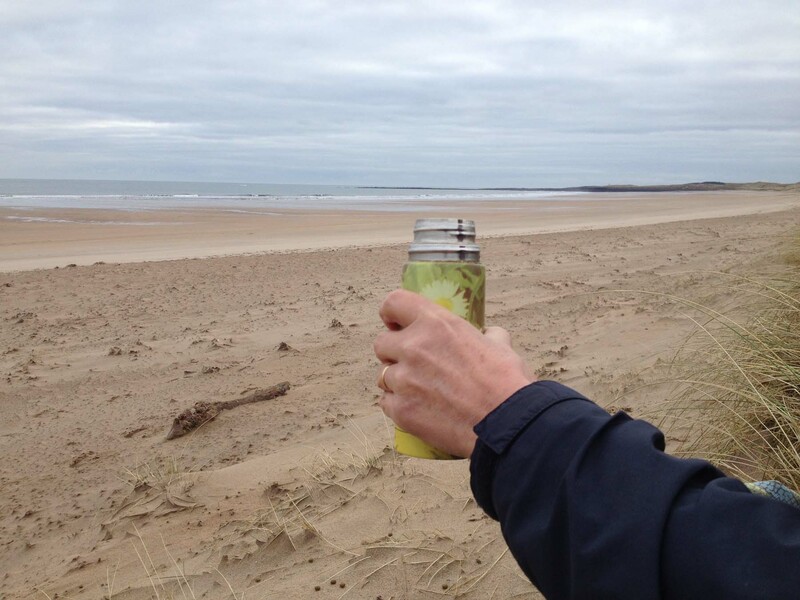 The retirement thermos comes out (these have to be counted back in carefully since we left one behind on one expedition. A Hanrahan – as one might say – “I counted them all out and I counted them all back.” You may have to search recent Falkland Island history to pick up the allusion!) At the end of the bay, we climbed up the dunes for the walk around Football Hole (such a great name!). 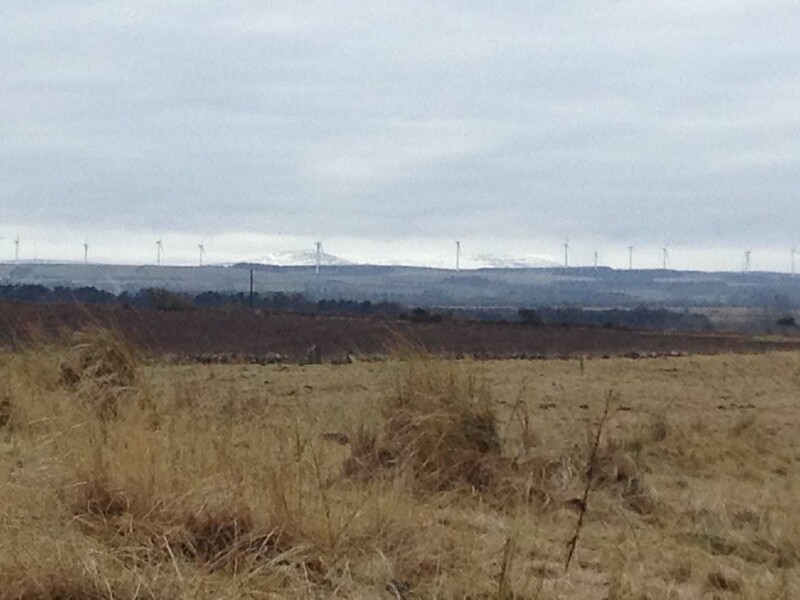 Looking inland you can just see the snowy Cheviots in the distance, and a reviled wind farm interrupting the view. (There is much ill feeling in Northumberland about wind farms – barely surprising since many have been sited in iconic situations). We clambered up a bony protrusion of Whin Sill. (Whin Sill is the local name for the ignaeous rock dolerite that is so important a feature of the Northumbrian landscape. The Castles of Bamburgh and Lindisfarne are built on Whin Sill protrusions, and the Romans incorporated it into some of the most dramatic parts of Hadrian’s wall). From the top we could now see Dunstanburgh Castle more clearly. But more importantly, we could also see our destination! 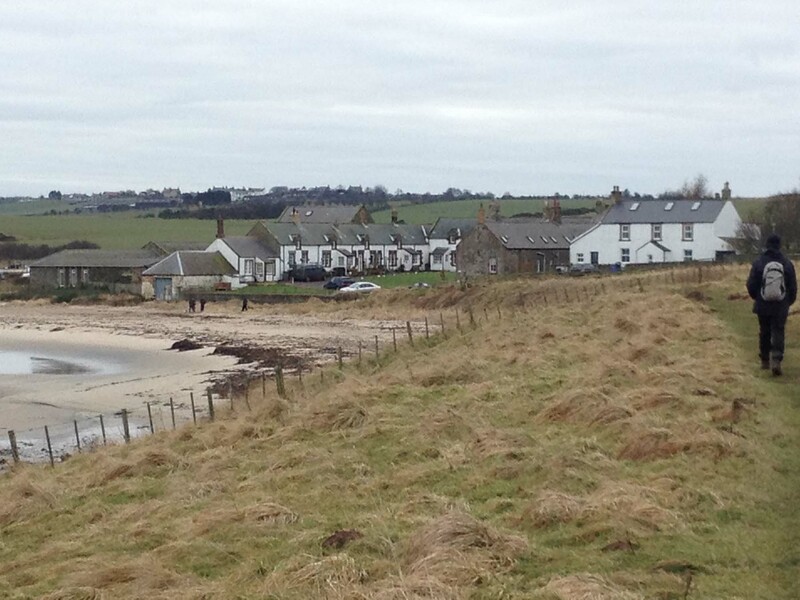 This is the tiny village of Low Newton. The old fishermen’s cottages are clustered round a green straight up from the beach. 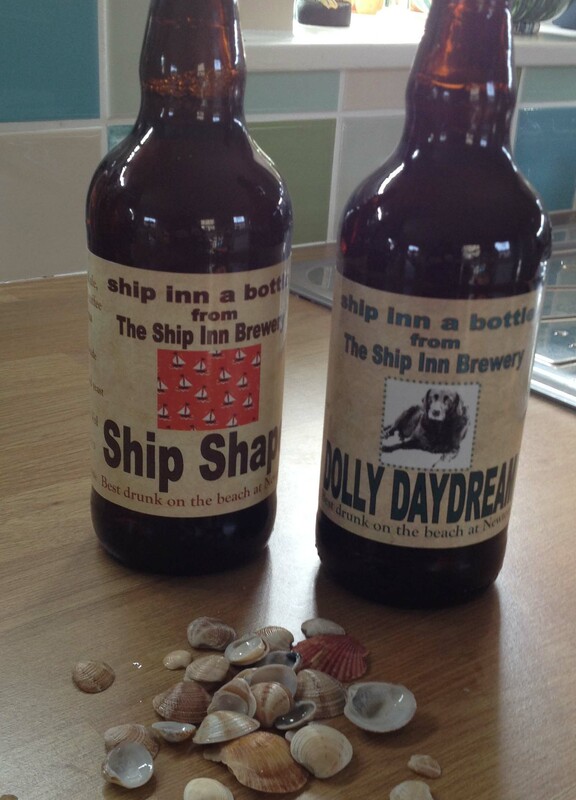 And here is the Ship Inn! It’s a very popular haunt nowadays – understandably as they have good food and the beer is very fine (they have their own brewery). 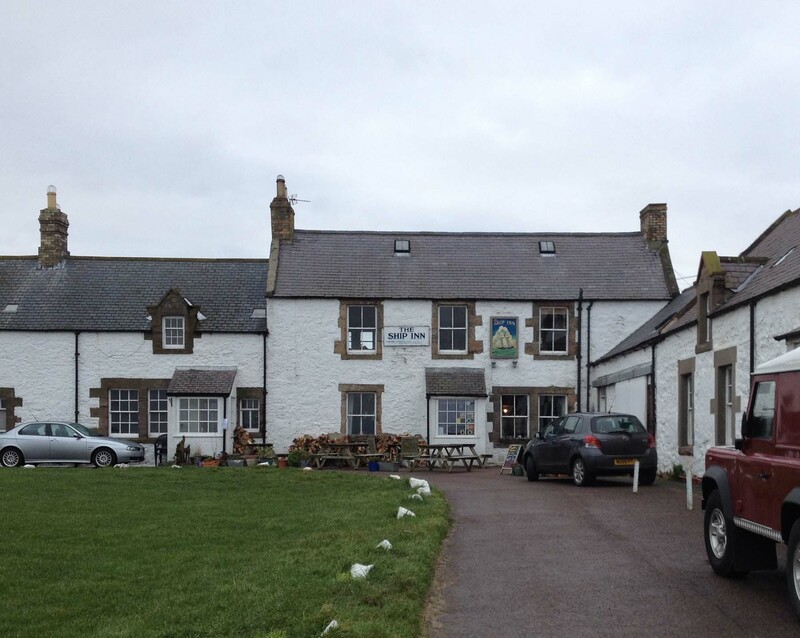 As for location – well, it’s to die for, centrally located right on the Northumbrian seashore between Dunstanburgh Castle and Beadnell Bay. Inside, there’s a fire, and food – and drink! 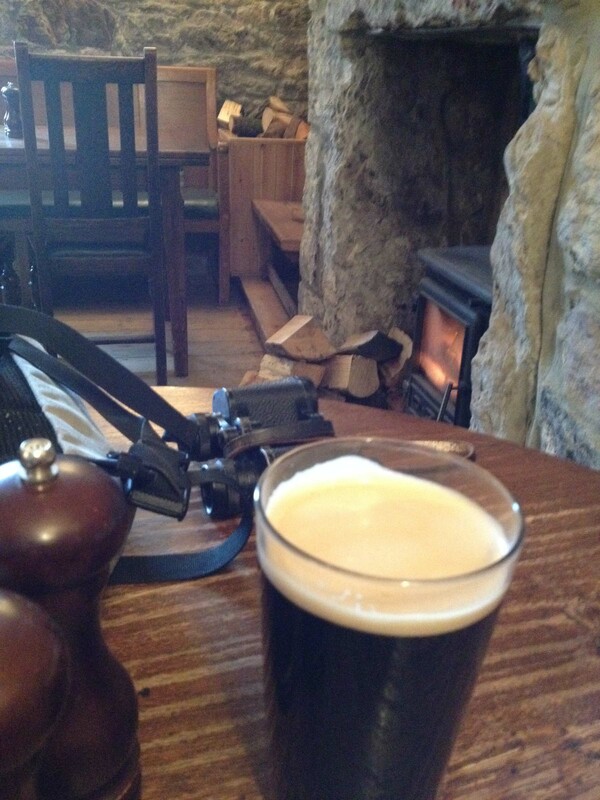 Perhaps best of all, we’ve timed it just right and the pub is almost empty – we can get seats right next to the fire! That’s a rarity – it’s a very busy pub. 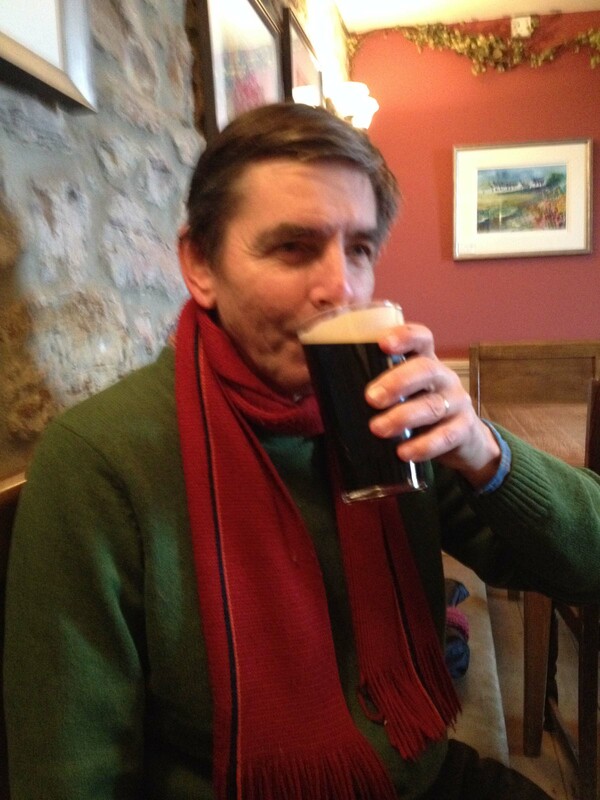 Stephen enjoying the Ship Inn Brewery’s 4.2 % Squid Ink. Apparently it’s “A classic stout with hints of espresso coffee, dark chocolate, figs and dates.” But the sanderlings, I hear you say – what about the sanderlings?!!! 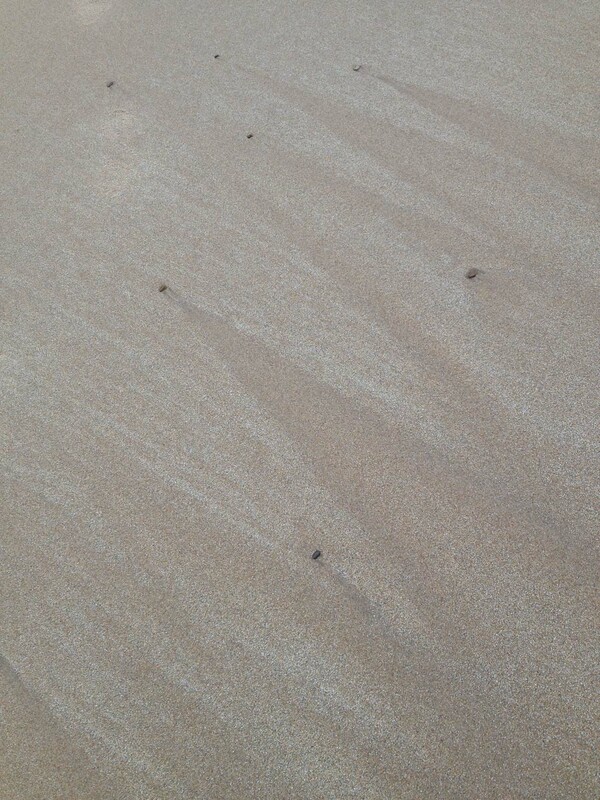 Well – we did see sanderlings! Oh – yes – we did see sanderlings! Now I want to explain why these little birds are so very special to us. We knew nothing of them until we came to live in Northumberland. 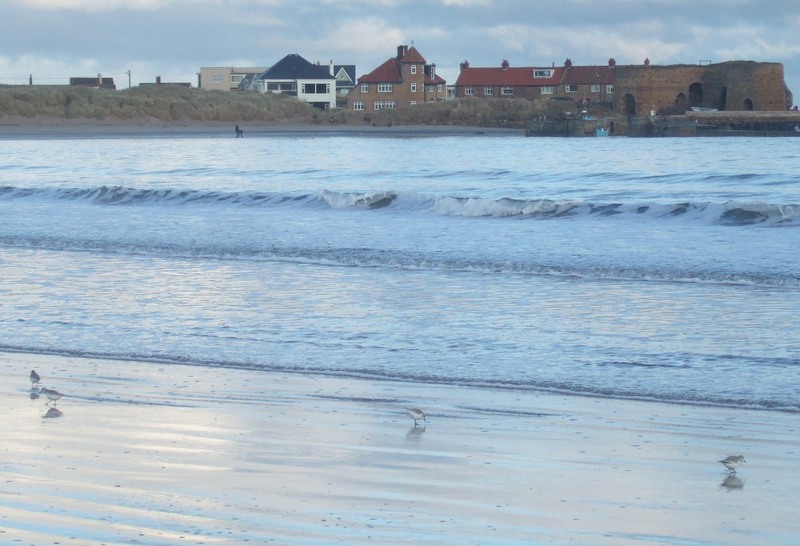 When we first saw them on Spittal beach, we were enchanted with their racing and running in and out of the waves. Derwent May, writing in the Times of January 2011 tells us more about them. 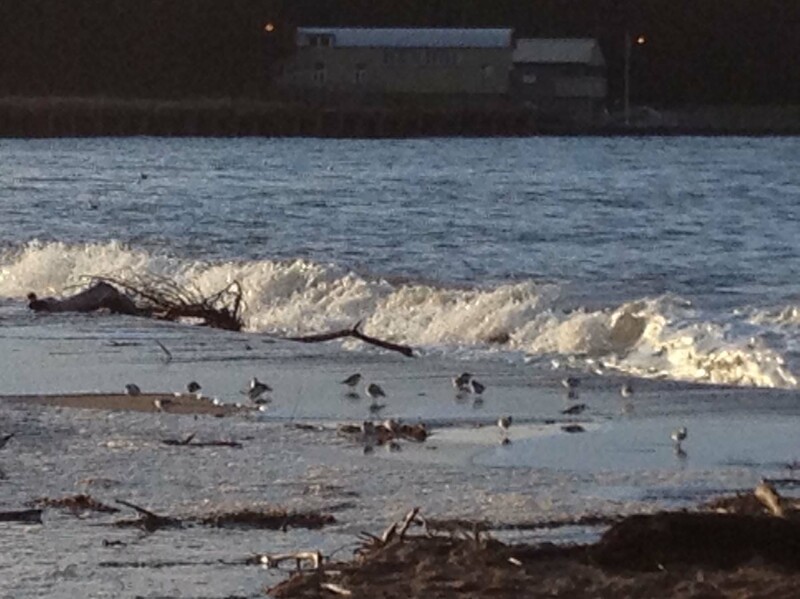 “On long sandy beaches right now you may see small, white wading birds chasing the withdrawing waves. They pick up tiny creatures that are floating in the water, then run back very fast to avoid the next incoming breaker that threatens to crash over them. To and fro they sprint, their legs like clockwork. 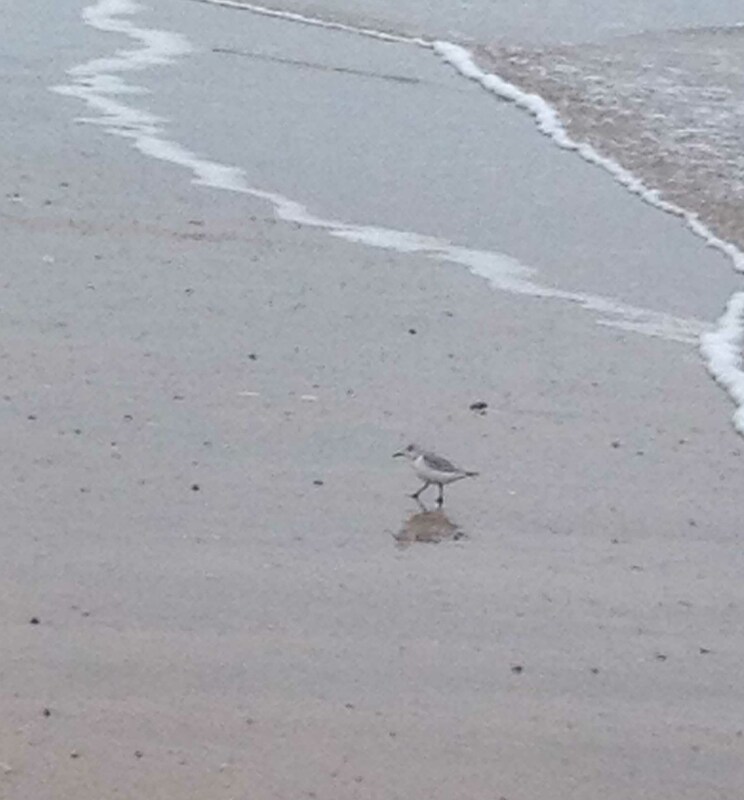 These sanderlings, little birds of the sand, have a special adaptation for their way of life: they have no hind toe that drags in the sand, so that they can run more quickly.” They are the only bird that has this adaptation. Sensible little birds – so do we! We often see them over winter on our local Spittal beaches, but this year I haven’t seen any yet. You have to catch them at the right time on the tide – food is most plentiful when the tide is very low. Wow! little sanderlings – that is truly amazing! As we retraced our steps back to the Beadnell car park, we saw many more fascinating birds – turnstones, dunlins, curlews, gulls, oystercatchers – even a rare and beautiful great white heron having a fine time, feasting on local delicacies in the Brunton Burn. But nothing made our day quite as much as the Keystone Cops of the British seaside: the sanderlings! Thank you for such an enjoyable visit to the beach. I do love the wildness of the that coastline. It was interesting to hear how unpopular the wind farms are. We loved them seeing them rise silently out of the mist in the UK and took it as a sign of UK commitment to more sustainable energy production. But as visitors we did not have the same attachment to particular vistas as a local would. I wish we had as many here in Australia but our backwards government still thinks burning brown coal and fracking for gas is a good idea. How nice to come on a winter beach walk with you – just the right pace, wonderful views, and all from my bed on Sunday morning! 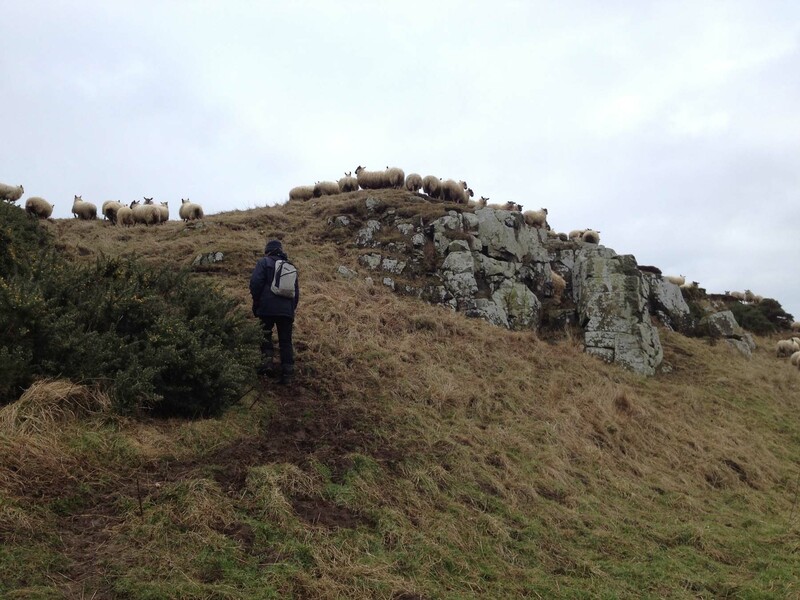 Particularly liked the picture of the sheep as part of the rocky outcrop. 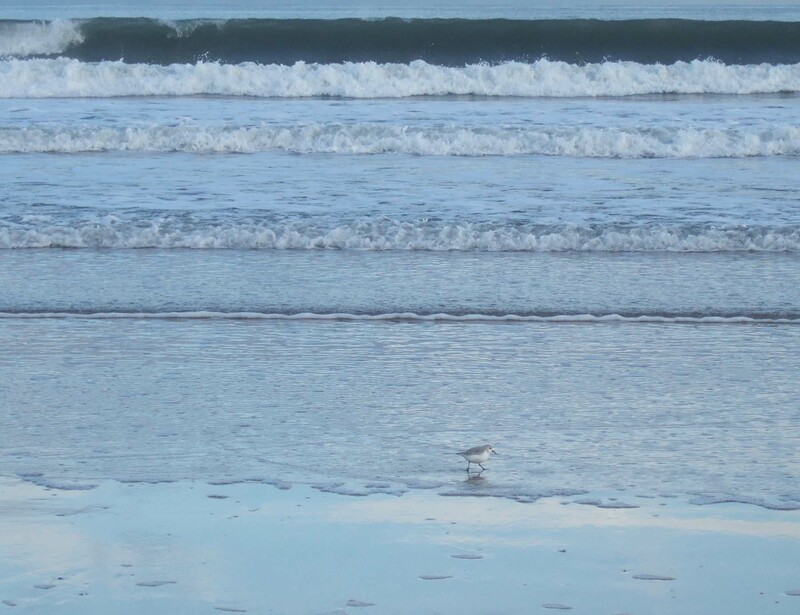 Thank you both for your kind comments – glad you liked our winter beach walk! Don’t worry, Zacyntha. Barra is our daddy-daughter thing. But I think we will have to do a joint post about the Hebrides after our next trip. Plane landing on beach, Whisky Galore sites, ferry to Eriskay, music from the Vatersay Boys, flowers on the machair – that sort of thing. What a beautiful ramble! Thanks for transporting me to such a glorious spot. I’m adding it to my long list of places to visit when I bring my family back to England again someday! 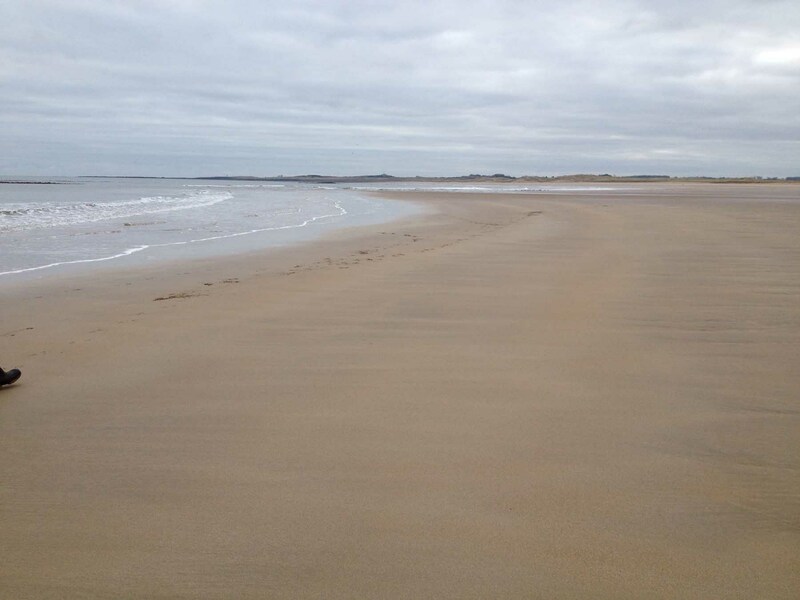 Glad you enjoyed the ramble, Sarah – yes, it’s definitely a Northumbrian beach to put on your “to walk” list!